Clostridium perfringens, a serious pathogen, causes enteric diseases in domestic animals and food poisoning in humans. The epidemiological relationship between C. perfringens isolates from the same source has previously been investigated chiefly by pulsed-field gel electrophoresis (PFGE). In this study the genetic diversity of C. perfringens isolated from various animals, from food poisoning outbreaks and from sludge was investigated. We used PFGE to examine the genetic diversity of 95 C. perfringens type A isolates from eight different sources. The isolates were also examined for the presence of the beta2 toxin gene (cpb2) and the enterotoxin gene (cpe). The cpb2 gene from the 28 cpb2-positive isolates was also partially sequenced (519 bp, corresponding to positions 188 to 706 in the consensus cpb2 sequence). The results of PFGE revealed a wide genetic diversity among the C. perfringens type A isolates. The genetic relatedness of the isolates ranged from 58 to 100% and 56 distinct PFGE types were identified. Almost all clusters with similar patterns comprised isolates with a known epidemiological correlation. Most of the isolates from pig, horse and sheep carried the cpb2 gene. All isolates originating from food poisoning outbreaks carried the cpe gene and three of these also carried cpb2. Two evolutionary different populations were identified by sequence analysis of the partially sequenced cpb2 genes from our study and cpb2 sequences previously deposited in GenBank. As revealed by PFGE, there was a wide genetic diversity among C. perfringens isolates from different sources. Epidemiologically related isolates showed a high genetic similarity, as expected, while isolates with no obvious epidemiological relationship expressed a lesser degree of genetic similarity. The wide diversity revealed by PFGE was not reflected in the 16S rRNA sequences, which had a considerable degree of sequence similarity. Sequence comparison of the partially sequenced cpb2 gene revealed two genetically different populations. This is to our knowledge the first study in which the genetic diversity of C. perfringens isolates both from different animals species, from food poisoning outbreaks and from sludge has been investigated. Clostridium perfringens, an anaerobic Gram-positive bacterium known to be a common pathogen in humans, in domestic animals and in wildlife, is the primary cause of clostridial enteric disease in domestic animals. The complete genome sequence of C. perfringens has been published previously . C. perfringens has 10 rRNA operons whose heterogeneity was investigated by Shimizu et al. . They found 18 polymorphic sites among the 16S rRNA genes. A common feature of C. perfringens is the large number of exotoxins produced; 17 different exotoxins have been described in the literature . In addition, C. perfringens produces an enterotoxin, CPE . Clostridium perfringens is subdivided into five toxinotypes (A – E) based on the production of the four major exotoxins (viz. alpha, beta, epsilon, and iota). The major toxins together with the enterotoxin and the beta2 toxin , play an important role in several serious diseases [3, 6]. CPE causes food-borne disease in humans, canine enteritis and porcine enteritis. Beta2 toxin, recently described , has been associated with enteric diseases in domestic animals, especially piglets [7–9] and horses . However, two recently published studies, by Jost et al. and Vilei et al. , demonstrated that beta2 toxin, encoded by cpb2, was expressed by most porcine C. perfringens isolates, but seldom by isolates of non-porcine origin. The results of those studies indicate that beta2 toxin does not cause enteritis in animal species other than pigs. Vilei et al. reported that gentamicin and streptomycin induced expression of an atypical cpb2 gene in a non-porcine isolate. In a recent publication by Waters et al. , it was reported that cpb2 of C. perfringens from horses was transcriptionally active and that the levels of cpb2 mRNA were 35-fold lower than a high beta2 toxin producing pig isolate. Isolates originating from humans with gastrointestinal diseases carrying both cpb2 and cpe have recently been described [14, 15]. The epidemiological relationship between C. perfringens isolates has previously been investigated primarily by pulsed-field gel electrophoresis (PFGE) and in most of these studies a majority of isolates from food poisoning outbreaks were examined [16–21]. C. perfringens isolates originating from poultry have also been investigated previously by PFGE [22–24]. The general conclusions drawn from the previously published articles, concerning both food poisoning outbreaks and animals, is that isolates from the same outbreak have very similar patterns while the genetic diversity is high in non-outbreak isolates and isolates selected randomly [17–19, 21–24]. The problem of DNA degradation of certain isolates due to endogenous bacterial nucleases, which are rather common among clostridial isolates, has been discussed elsewhere [16, 18, 25, 26]. The purpose of this study was to compare the genetic relationships of C. perfringens type A from eight different sources by PFGE. A further aim was to investigate the distribution of the cpb2 and cpe genes. The cpb2 gene from all cpb2-positive isolates was also partially sequenced. In this study a generally wide genetic diversity of C. perfringens isolates from eight different sources was found. Furthermore, PFGE clearly distinguished between unrelated isolates of C.perfringens and supported a clonal relationship between related isolates. Sequence analysis of the partially sequenced cpb2 gene revealed two genetically different populations of the gene. Multiplex PCR detected only the alpha-toxin gene (plc) and all isolates were therefore classified as C. perfringens type A. Altogether 28 isolates carried the cpb2 gene and 17 carried the cpe gene (Table 1). 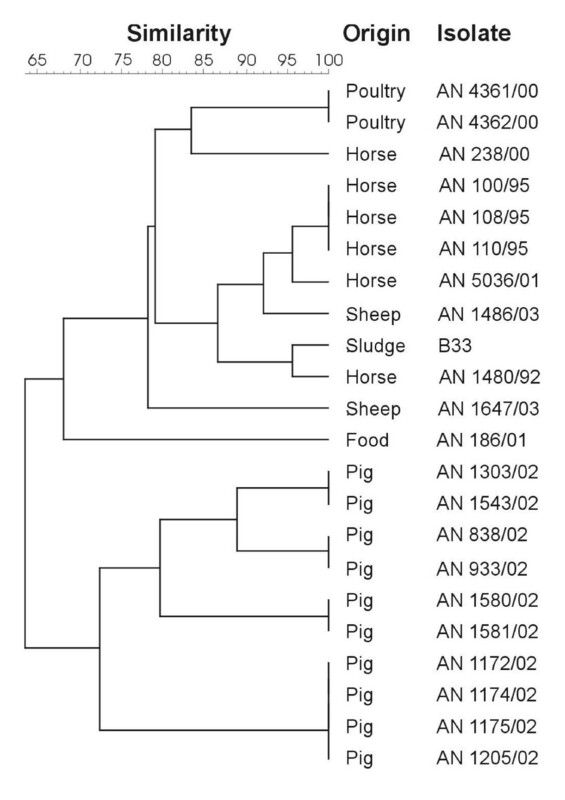 The cpb2 gene was found in 6 of the 8 groups studied: pigs (83%), horses (60%), sheep (50%), food poisoning outbreaks (20%), sludge (21%) and poultry (10%). The cpb2 gene was not detected in any of the isolates from roedeer or wild birds. The cpe gene was found in all isolates originating from food poisoning outbreaks and in one isolate each from horse and roedeer. Both cpb2 and cpe were found in three isolates originating from outbreaks of food poisoning. c Isolated from horse no. 5 in the study by Gustafsson et al. .
Of the 101 isolates of C. perfringens examined in this study, 88 were successfully characterized by PFGE after genomic DNA digestion with Sma I (Table 1, Figure 1). The Sma I PFGE patterns of some of these isolates are shown in Figure 2. The genetic relatedness of the isolates ranged from 57 to 100% and 56 distinct PFGE profiles were observed. Cluster analysis of PFGE data showed no apparent relationship between the source of the isolate and its PFGE profile. However, the isolates originating from food poisoning outbreak formed distinct clusters in the dendrogram (Figure 1). Altogether, 17 PFGE profiles with indistinguishable patterns were found. Most of the isolates having PFGE profiles with indistinguishable patterns were from the same outbreak of disease. All of the eight food isolates clustering with indistinguishable patterns originated from the same outbreak of food poisoning. The poultry and porcine isolates clustering with indistinguishable patterns were also isolated from the same outbreaks. Two of the PFGE profiles with indistinguishable patterns contained isolates with no obvious epidemiological correlation. Of the 28 cpb2-positive isolates, 22 were successfully characterized by PFGE. The Sma I PFGE patterns of these isolates are shown in Figure 3. The overall genetic relatedness of the cpb2-positive isolates was 63%. All the 10 isolates originating from pigs cluster together with a genetic relatedness of 72%. This cluster was subdivided into four subclusters with 100% genetic relatedness in each cluster. Cluster analysis of Sma I-digested DNA from 88 strains of C. perfringens separated by PFGE. Representative PFGE patterns of 14 C. perfringens isolates. The patterns obtained by the PFGE protocol with Sma I digestion. Lanes M1, chromosomal DNA of Salmonella serotype Braenderup (H9812) digested with Xba I as reference size markers (size range 33 to 1,135 kb). Lanes M2, lambda ladder with a size range of 0.13 to 194 kb (Low Range PFG Marker, New England Biolabs Inc.). All C. perfringens isolates on this gel are from poultry. Lane 1, C. perfringens isolate AN 4961/00; lane 2, AN 4962/00; lane 3, AN 4208/00; lane 4, AN 4209/00; lane 5, AN 4354/00; lane 6, AN 4355/00; lane 7, AN 4739/00; lane 8, AN 4965/00; lane 9, AN 4966/00; lane 10, AN 4967/00; lane 11, AN 4989/00; lane12, AN 4990/00; lane13, AN 4947/00 and lane 14, AN 4948/00. Cluster analysis of Sma I-digested DNA from the 22 cpb2-positive isolates of C. perfringens. In the phylogenetic tree (Figure 4) two main groups of the partially sequenced cpb2 gene (the distance matrix comprised 425 nucleotide positions, corresponding to positions 282 to 706 in the consensus cpb2 sequence) were observed, I and II, each subdivided to three subclusters, a, b, c. A total of six groups could be identified (Figure 4, Table 2). Groups I and II are mutually related, with a sequence similarity of 73.8%. All isolates in our study were found in group I. The sequence similarities within this group varied between 93.3% and 100%. Our cpb2 sequences from porcine (Ia) and from non-porcine (Ib) cluster with the cpb2 sequences deposited by Vilei et al . The three cpb2 sequences from food and the horse isolate AN 5036/01 was found in group Ic. Most of the isolates in group II were isolated in the USA, while most of those in group I were isolated in Europe. Radial representation of a phylogenetic tree prepared by the neighbour-joining method showing phylogeny of the cpb2 gene. 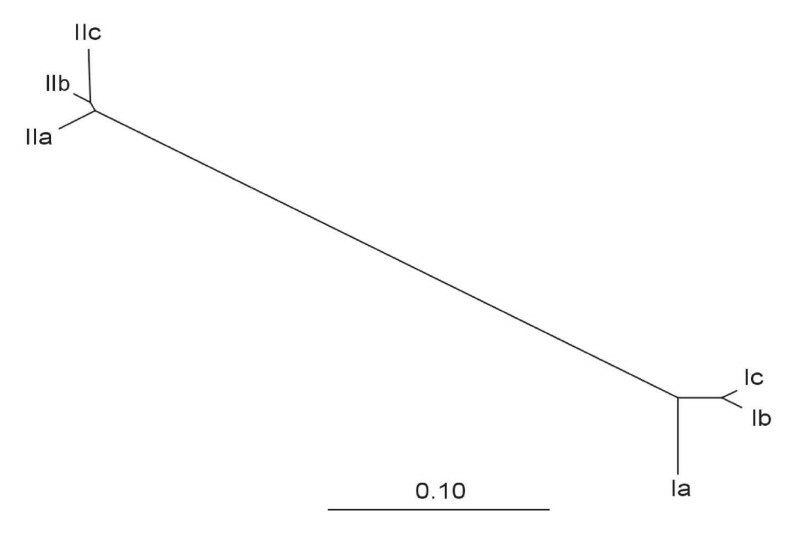 The length of the scalebar represents 10 nucleotide substitutions per 100 positions. Sequencing of the 16S rRNA gene revealed a very high similarity among the 11 isolates analysed. As shown in Table 3, altogether 18 polymorphic sites were detected in the 16S rRNA region between nucleotide no. 91 and 1401 (based on the consensus sequence of the 16S rRNA gene in the 10 rRNA operons of C. perfringens strain 13, rrnA – rrnI). Seven of the polymorphisms found in our isolates were also found in C. perfringens strain 13 . At position 154 of the 16S rRNA genes, one nucleotide difference was observed; at this position, isolates from food poisoning outbreaks (AN 4279/01 455/99) had a T, whereas all others had a C. This was the only nucleotide difference involving all operons that was observed in the sequenced isolates. The numbers (91 – 1401) refer to the nucleotide positions of the ten 16S rRNA genes of C. perfringens, strain 13. A, C, G, T are standard abbreviations used for the nucleotides and polymorphisms are indicated by the letter code suggested by the Nomenclature Committee of the International Union of Biochemistry (Y = C/T, R = A/G and W = A/T). The high prevalence of the cpb2 gene in isolates from pigs and horses is consistent with other studies reporting a high prevalence of cpb2 in pigs and horses suffering from gastrointestinal diseases [7–10]. The distribution of cpe in isolates of animal origin is low, which also tallies with data from other studies [27–29]. Isolates from food poisoning outbreaks typically carry a chromosomal cpe gene [21, 30, 31]; in this study three of these isolates also carried the cpb2 gene. In this study three of the isolates from food poisoning outbreaks also carried the cpb2 gene. Isolates originating from humans with gastrointestinal diseases, carrying both cpb2 and cpe, have been described recently [14, 15]. The aim of this study was to elucidate the general genetic diversity of C. perfringens type A isolated from a variety of sources in Sweden and Norway. In the present study, any band difference between two PFGE types was considered sufficient to distinguish between two different PFGE types. The results obtained by PFGE reveal a wide genetic diversity and no definite relationship between the source of the isolate and the positions in the dendrogram can be established. The wide genetic diversity revealed in this study was not unexpected, because of the wide diversity of the isolates analysed. Previous studies on C. perfringens by PFGE have shown that isolates from the same food poisoning outbreak have a very similar pattern [18–20] and that C. perfringens isolated from retail food showed a high genetic variation . This has also been observed in poultry where isolates from diseased birds showed a similar pattern, whereas the genetic diversity was considerable in isolates from healthy birds [22–24]. Those observations are consistent with our results, where we can see that PFGE profiles with indistinguishable patterns in almost all cases contain isolates having a known epidemiological connection. Comparison of the PFGE patterns of the cpb2-positive isolates revealed a clonal relationship among the porcine isolates (group Ia), which cluster together in the dendrogram (Figure 3). However, no clonal relationship could be established for isolates belonging to groups Ib and Ic. The cpb2 gene is known to be located on several low copy number plasmids [5, 15]. The genetic diversity of cpb2-positive isolates is therefore, not surprising, as PFGE mainly reflects the chromosomal diversity. In this study 13% of the isolates were non-typable due to DNA degradation. This problem has been reported previously [16, 18, 32]. It is a disadvantage when PFGE is used as a subtyping method for clostridial species. However, problems with DNA degradation have not been reported previously when analysing poultry isolates by PFGE [22–24]. As in this study none of the isolates from poultry, horses or pigs were found degraded, PFGE is a very suitable method for epidemiological investigation of enteric diseases caused by C. perfringens. The 16S rRNA gene was sequenced for three of the isolates that were found degraded. Neither DNA degradation nor the generally wide genetic diversity was reflected in the 16S rRNA sequences, which were very similar. The use of Salmonella enterica subsp. enterica serotype Braenderup, (Salmonella Braenderup H9812), digested with Xba I as a size marker made it easier to normalize tiff images, than by using a commercially available weight marker, thanks to stable levels of DNA in the prepared plugs . In our opinion, PFGE is a reliable and robust method that can be used in combination with epidemiological data to establish C.perfringens as the etiological agent whether in food-borne outbreaks or in outbreaks of enteric disease in domestic animals. Sequence analysis of the cpb2 gene (Figure 4) indicated the existence of two evolutionary differing populations based on 425 nucleotide positions, corresponding to positions 282 to 706 in the consensus cpb2 sequence. A relatively high sequence difference of 26.2% showed that cpb2 evolved into two different variants (I and II). The isolates sequenced in this study all belonged to group I and were divided into three sub-clusters: porcine isolates (Ia), animal isolates of non-porcine origin (Ib), and isolates from food poisoning outbreaks (Ic). One of the horse isolates AN 5036/01 clustered together with the food isolates. Most of the group I cpb2-positive isolates were of European origin , while most cpb2-positive isolates from group II had an American origin . However, isolates containing cpb2 isolated from humans with a gastrointestinal disease were distributed in both groups (Ic and IIa), irrespective of origin . Groups I and II both contained isolates capable of expressing CPB2 and also isolates that express non-detectable levels of beta2 toxin [11, 12, 15]. Jost et al. identified a cpb2 gene that was present in most non-porcine isolates. The cpb2 sequences deposited by Jost et al. were all affiliated to group II (IIa, IIb or IIc). Isolates from European animals carrying the cpb2 gene were all affiliated to group I. It is interesting that none of the cpb2-positive isolates from animals in Europe carried the cpb2 gene, which are found in group II. The reason for sequencing the 16S rRNA gene was to ascertain whether the diversity found by PFGE analysis was reflected in the 16S rRNA gene. Isolates that were degraded and those found in different clusters in the PFGE dendrogram showed a very high sequence similarity. However, we found 18 positions with polymorphisms among our investigated isolates (Table 3). These polymorphisms are caused by the fact that C. perfringens carries 10 rRNA operons and sequence differences exist between them. Some of these polymorphisms were isolate specific. Seven of those found by us were also found by Shimizu et al. who analysed all the 10 rRNA operons of C. perfringens strain 13. The polymorphisms found in the C. perfringens 16S rRNA genes reflect certain diversity. In a few other bacterial species polymorphisms have been used for subtyping , but due to the 10 rRNA operons in C. perfringens, it is more difficult to use the polymorphism pattern for subtyping. In this study a wide genetic diversity of C. perfringens was found when isolates from eight different sources were analysed by PFGE. Degradation of DNA was observed in 13% of the isolates investigated. The considerable diversity found by PFGE was not reflected in the 16S rRNA sequences, which were very similar. As expected, C. perfringens isolates from the same outbreak seemed to be similar genetically, while isolates with no obvious epidemiological connection differed more noticeably. The groups with the highest genetic relatedness were isolates from food-borne outbreaks and pig isolates carrying the cpb2 gene. 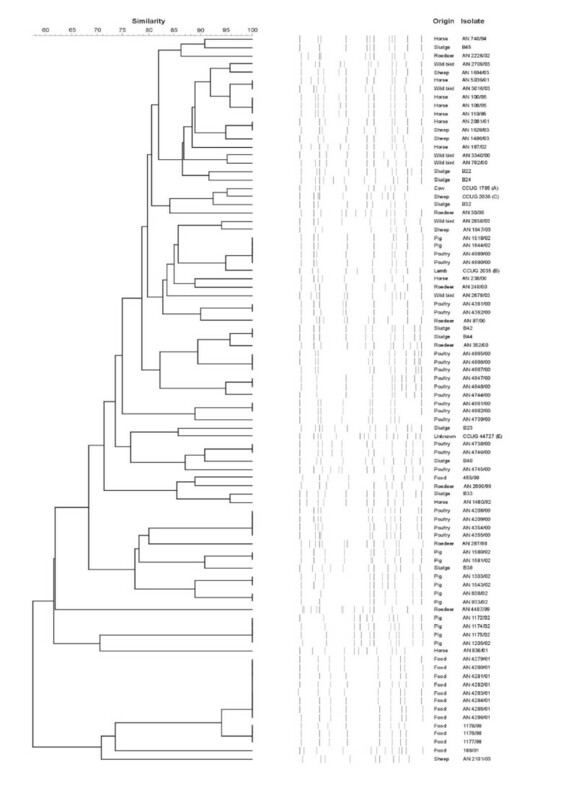 Isolates from the other sources were more widely dispersed in the dendrogram. Two genetically differing populations of the partially sequenced cpb2 gene were found by sequence analysis. Furthermore, isolates causing enteric diseases in humans and other animals seem not to have a strong genetic relatedness, based on PFGE analysis. We conclude that PFGE is a reliable and robust method for genotyping of C. perfringens isolates. Altogether 95 isolates of C. perfringens type A were obtained from eight different sources: poultry (n = 20), pigs (n = 12), horses (n = 10), sheep (n = 6), roedeer (n = 12), wild birds (n = 6), food poisoning outbreaks (n = 15) and environmental samples (n = 14) (Table 1). The isolates were collected between 1994 to 2003 (Table 1), all isolates from sludge were collected 2002. One C. perfringens type strain CCUG 1795 (A) and five reference strains, CIP 106526 (A), CCUG 2035 (B), CCUG 2036 (C), CCUG 2037 (D) and CCUG 44727 (E), were also included in the study. CCUG strains were obtained from the Culture Collection of the University of Gothenburg, Sweden; the CIP strain was obtained from the Culture Collection of Institute Pasteur, Paris, France. The C. perfringens isolates were identified as type A by applying standard biochemical tests and multiplex-PCR . The isolates were stored at -70°C. Thawed isolates were grown on fastidious anaerobe agar (FAA) (LabM, Bury, Lancashire, England) with 10% defibrinated horse blood and incubated in anaerobic jars at 37°C. The four major toxin genes plc, cpb1, iap and etx were detected by a modified version of the multiplex PCR assay of Engström et al. . Template DNA (2 μl), prepared by the direct lysis method of Herholz et al. was added to a 50 μl reaction mixture, with the following reagents: 50 mM KCl, 10 mM Tris-HCl (pH 8.3), 2.5 mM MgCl2, 50 nM of each deoxynucleotide, 1 U of AmpliTaq Gold DNA polymerase (Applied Biosystems, Foster City, USA), 50 nM of each plc (α-toxin) primer, 25 nM of each cpb1 primer, 100 nM of each etx primer and 25 nM of each iap primer. The thermocycling (incubations for 1 min at 94°C, 55°C and 72°C, respectively, repeated 35 times) was preceded by incubation for 10 min at 94°C. The presence of the CPB2 gene (cpb2) and enterotoxin gene (cpe) was also determined. cpb2 primers (250 nM) from Herholz et al. and cpe primers (50 nM) from Kadra et al. were used in a duplex PCR. The conditions were as in the multiplex PCR, except for the annealing temperature, which was 59°C. The amplicons were analysed by electrophoresis on a 1.5% agarose gel according to standard procedures. The isolates analysed by PFGE are listed in Table 1. The PFGE protocol of Lukinmaa et al. was followed in all essentials. DNA was digested with Sma I. Electrophoresis was performed at 6 V/cm with 2.0% AgaroseNA agar (Amersham Biosciences, Uppsala, Sweden) by using the CHEF-DR II system (Bio-Rad Laboratories, Richmond, Calif, USA). 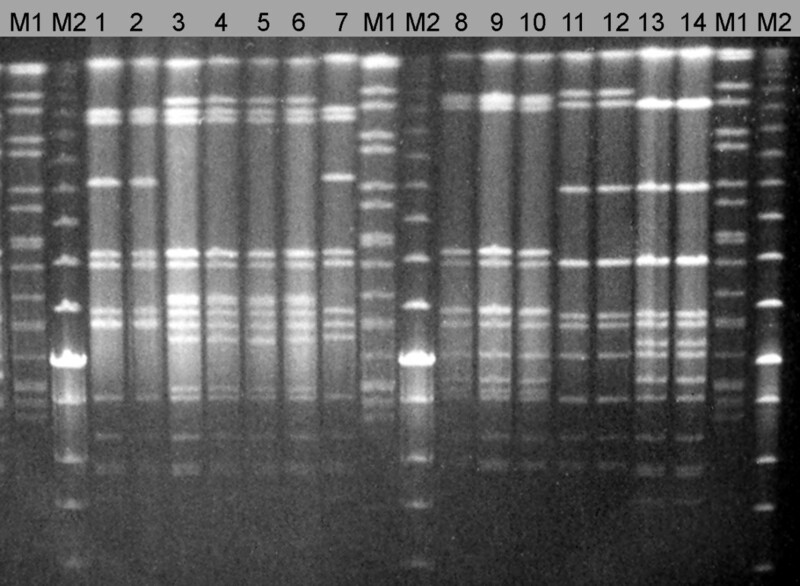 Running conditions for Sma I-digested DNA were 0.5 to 40 s for 20 h. Lambda ladder with a size range of 0.13 to 194 kb (Low Range PFG Marker, New England Biolabs Inc.) and Salmonella Braenderup (H9812) digested with Xba I, which is described in greater detail by Hunter et al. , were used as molecular weight standards. The DNA bands were visualized on a UV transilluminator and Polaroid photographs of the gels were scanned and images in tiff file format were imported into GelCompar II (Applied Maths, Kortrijk, Belgium). Degrees of similarity between isolates were calculated with 1.4% tolerance and 0.5% optimization by applying the band-based Dice similarity coefficient. Clustering analysis was performed with the unweighted pair group method (UPGMA), by average linkages. The 16S rRNA genes of the isolates were amplified with primers  suitable for members of the phylum Firmicutes (Table 4). The amplicons were used for cycle sequencing with labelled terminators (Big Dye; Applied Biosystems, Foster City, Calif, USA) and with the sequencing primers listed in Table 4. The sequencing products were analysed with an ABI Prism 3100 genetic analyser (Applied Biosystems) and contigs were generated with the Contig Express program included in the Vector NTI Suite (InforMax, Bethesda, Md, USA). The contigs were edited manually with the Genetic Data Environment software  before further analysis and deposition in GenBank. 1 Forward or reverse (F or R). 2 According to the E. coli 16S rRNA sequence (universal region no.). 3 PCR or sequencing (Seq.). The cpb2 gene of the 28 cpb2-positive isolates was amplified with the β2 primers (250 nM) from Herholz etal. and these primers were also used in the cycle sequencing reaction, as described earlier. The cpb2 sequences determined in this work were aligned with sequences retrieved from GenBank by the AlignX program in the Vector NTI Suite. The alignment was checked with the Genetic Data Environment software . A phylogenetic tree comprising 88 cpb2 sequences was constructed by the neighbour-joining method  from a distance matrix that was corrected for multiple substitutions at single locations by the two-parameter method . A representative of cluster Ib was chosen as outgroup. Only one representative for each subgroup was included in the final tree. The distance matrix comprised 425 nucleotide positions, corresponding to positions 282 to 706 in the cpb2 sequence of C. perfringens, isolate P762/97 [Gen Bank:AJ537531]. Consenus alignments are shown in Additional file 1. The sequences of the cpb2 gene of the 28 cpb2-positive isolates have been deposited in GenBank (National Center for Biotechnology, Bethesda, Md, USA) under accession numbers [GenBank:DQ201544 – GenBank:DQ201571]. The 16S rRNA sequences have also been deposited in GenBank under accession numbers [GenBank:DQ196132 – GenBank:DQ196142]. This study was financially supported by grants from the Swedish Farmers' Foundation for Agricultural Research and the Swedish National Veterinary Institute. We also wish to acknowledge the support of the European Concerted Action QLK2-CT2001-01267 on genus Clostridium. The authors are grateful to Marianne Persson for excellent technical assistance. We thank Per Einar Granum, Norwegian School of Veterinary Science, Oslo, Norway, for kindly providing isolates from food poisoning outbreaks. Further we thank the Department of Wildlife, National Veterinary Institute, Uppsala, Sweden for kindly providing data about the isolates from wild animals. AJ, KEJ, AA, VB, BEE participitated in the discussions on the study design, the collection of isolates, analysis and interpretation of the data, and in the writing of the manuscript. AJ and AA carried out the analysis and interpretation of PFGE data. Analysis and interpretation of sequence data of the cpb2 gene and 16S rRNA gene were carried out by AJ, KEJ and EB. AJ was the principal author of the manuscript. All authors read and approved the final manuscript.